Launched in September 2014 by Mahindra Two Wheelers Limited (MTWL), the Mahindra Gusto is the first global scooter from the MTWL stable. The 110 cc scooter is packed with features such as a height adjustable seat, find-me lamps and flip keys that are more traditionally seen in cars and is Mahindra’s entry in the highly competitive 110cc scooter market. Mahindra Two Wheelers Limited is part of the USD 16.9 billion Mahindra Group. Flying Cursor Interactive Private Limited is a digital agency that creates brand conversations that are interesting, inspiring and rewarding. Established in 2009, Flying Cursor is a full service agency that focuses on 5 key areas: social media marketing, technology and innovation, websites, video production and digital media. Some of our key clients include National Geographic Channel, Fox Life, Bisleri, Urzza, Standard Chartered and Sunrisers Hyderabad. Although the Mahindra Gusto launched with positive reviews within the Auto Industry and has won awards and accolades along the way (such as the Viewer’s Choice Scooter of The Year at the CNBC TV18 Overdrive Awards 2015) – this has not translated onto the digital landscape. Mahindra Gusto had garnered very little interest, buzz or brand recognition with the digital audience. To build brand recognition, seed conversations and generate engagement around the Mahindra Gusto with the digital audience. For a scooter brand to build brand recognition in the market, we felt it was essential that potential customers not only see the scooter being ridden on the roads, they should have the opportunity to interact with people who have ridden the Gusto and perhaps even get the chance to ride the Gusto for themselves. We had to find a way to translate these experiences to the digital audience. Our aim was to show them not only how they could fit the Gusto scooter into their daily routines but also how the Gusto could be used to explore their passions and interests. The Idea: To build a digital property that brings together interesting and passionate communities, enabling them to explore the things they love on a fleet of Mahindra Gusto scooters. The thought was to document these journeys on the digital space, allowing fans and followers of these communities to watch and follow along, thereby building a connect between chasing your passion and the Mahindra Gusto scooter. We even gave a few lucky members of the digital audience the chance to participate in these journeys as well. And that is how the Go Gusto Rides were born. Execution: We started the journey of the Go Gusto Rides by exploring one of the biggest and most popular interests for the digital audience: Food. We collaborated with influential food bloggers such as Kalyan Karmakar (@finelychopped), Amrita Rana (@amritaoflife), Nandita Iyer (@saffrontrail), Archana (@archanaskitchen) and Nivedith (@nivedithg) to create the “Go Gusto Rides” – a series of food themed scooter rides that were held in Mumbai and Bangalore. We developed a three phase digital strategy around the Go Gusto Rides to address the objectives of the campaign. In Phase I, a week before the Go Gusto Rides, we gave the food bloggers a Gusto scooter for the entire week to explore their respective cities, scope out local eateries or markets and incorporate the scooter into their daily routine. The food bloggers documented their rides and explorations on their social media profiles. Through these Facebook posts and tweets, we began seeding the association of the Gusto scooter with the food community and giving the digital community the chance to see the Gusto scooter being ridden by influential digital figures. During this week, the food bloggers also began creating buzz around the upcoming Go Gusto Rides by introducing their followers and audience to the concept of the food themed scooter ride and teasing the possible pit stops and route of the ride. At the same time, through the brand’s social media pages we ran a series of contests to invite 10 members of the digital foodie community as participants on the Go Gusto Rides. At the end of the pre-buzz week, we held the Go Gusto Rides – where the food bloggers and participants rode a fleet of Gusto scooters, following a specially curated route to 3 iconic restaurants in Mumbai and Bangalore. The bloggers and participants live-tweeted the entire ride – sharing regular updates, pictures and videos in real time so that the digital audience could follow along, share recommendations for dishes to eat and participate in the conversations around the Go Gusto Rides. We also documented these rides and released films on these rides that allowed a larger digital community to experience the Go Gusto Rides, to see a fleet of Gusto scooters and participate in conversations around the scooter and the rides. These films were promoted on social media (Facebook and Twitter) as well as through native advertisements and content seeing in the form of mobile and network video ads. 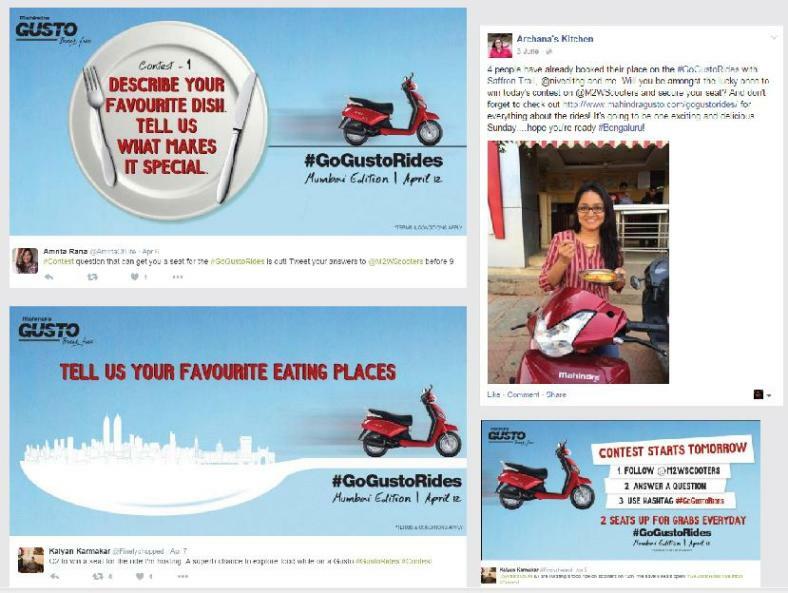 The Go Gusto Rides (Mumbai and Bangalore edition) saw a cumulative campaign reach of more than 4 million digital users across Facebook and Twitter. Our hashtag #GoGustoRides was seen more than 21.5 million times on Twitter and had more than 159 million timeline deliveries [Source: Hashtracking.com]. 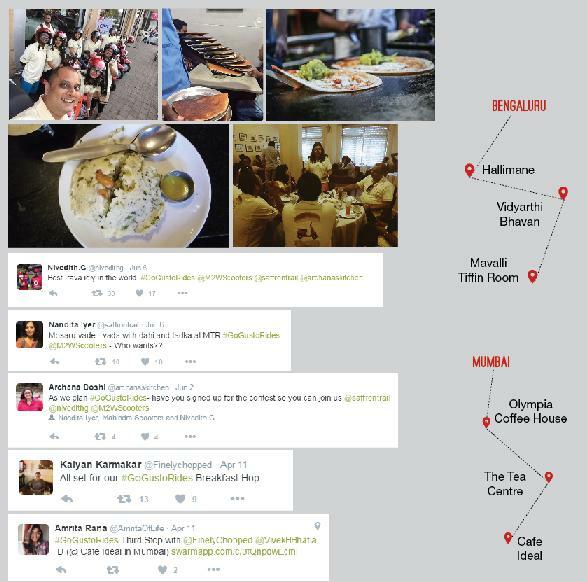 #GoGustoRides was one of the top trending topics of conversation on Twitter in India on at least 5 separate days. We also saw more than 73 lakh engagements with our campaign (through shares, likes, comments, re-tweets, replies and clicks). Our digital films documenting the Bangalore and Mumbai rides garnered more than 38 lakh views. The Go Gusto Rides campaign was also covered in numerous digital publications. While the numbers were out of the roof, it was the reactions from the digital audience that blew us away. Their keen interest in following along with the campaign, the nostalgia they showed for the ride locations and the numerous requests we received from audience members on Twitter to bring the Go Gusto Rides to their city are ample proof of the success of this campaign. We were able to introduce the Mahindra Gusto to food lovers in India and convey that the Mahindra Gusto was a scooter for people who wish to explore their passions, thereby building a brand connect and creating brand recognition. By co-creating with influential online personalities, our potential customers and audience were able to read and hear stories and experiences of the Gusto scooter from people who they knew and looked up to, rather than from the brand itself. This enabled us to build a narrative of trust and authenticity in the conversations around the Go Gusto Rides and the Mahindra Gusto scooters.